Curry recipes are growing on my family. The sweet potato curry embodies a highlight in this journey. 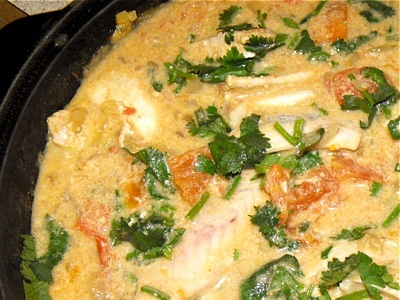 Curry went from being a dish which was rarely requested or made in our household to being one of our favourites. I think this particular recipe played an important role in converting my family into curry enthusiasts. The recipe using sweet potato and chicken evolved from a basic curry recipe which was tailored to adhere to what ingredients were in season at that point in time. Once you know the basics of making a curry you can add whatever takes your fancy. With a bit of prior experience it usually always turns out to be good, if not an excellent and mouth watering curry. Astonishingly this curry recipe turned out to be the best curry recipe yet. It simply works like this with experience everything becomes better. Acquiring the knowledge of what goes well together and getting the amount of spices and the spices itself right is a development. Can we cook this curry recipe tomorrow evening again? I know over indulging bears the danger of getting fed up. Although I would imagine getting fed up of this curry recipe would be quite unlikely. There are so many flavours that come together in an exciting way so I don’t worry too much about my taste buds getting bored. First prepare the vegetables to set aside. Wash, scrape and slice or cube the sweet potatoes and the carrots. Clean the green beans and cut off both ends. Clean and cube the tomatoes. Peel the turmeric, ginger and the garlic and either squash them or mash them in a mortar if you have one, but finely dicing does the job as well. My Mum always dices them. Use a large pan that can fit all ingredients. Heat the tablespoon of coconut oil on low to medium. (Not too hot otherwise the spices will just burn and leave a burned taste in the curry. Meanwhile peel and dice the two onions. When a water drop sizzles in the pan, start adding the half teaspoon of chilli flakes, the teaspoon of cumin seeds, the two teaspoons of ground cumin and the teaspoon of ground coriander. Stir and fry them very briefly, about 30 seconds. Now add the prepared ginger and turmeric. Stir and fry them briefly. Stay on the lower heat levels and stir in the two onions, the garlic and ½ a teaspoon of Himalayan crystal salt. Let them cook with the lid on and frequent stirring until they are translucent. This takes about 3 to 5 minutes. It is now time to mix under the cubed tomatoes and a tablespoon of tomato paste and ¼ teaspoon of mild chilli. Let the mix cook until the tomatoes disintegrate. You can increase the heat a bit to medium (this always depends on your stove how well it heats so keep an eye on it). This takes about another 3 to five minutes. Mix the green beans under. When heated through after 3 minutes add the carrots and sweet potato slices. Shake the can of coconut cream and pour into the heated through mix. Add the teaspoon of garam masala. Stir carefully. Once the sauce has had a chance to simmer for a while distribute the chicken cubes. Make sure to cover the cubes in sauce so they are totally submerged, this will give the flavours the opportunity to penetrate into the chicken. Let it cook for 7 minutes then turn off the heat. Wash, dry and chop the fresh coriander. When turned off stir in the coriander. Let the curry sit for 5 minutes before surfing the curry. Serving suggestions: Basmati rice goes well with it. 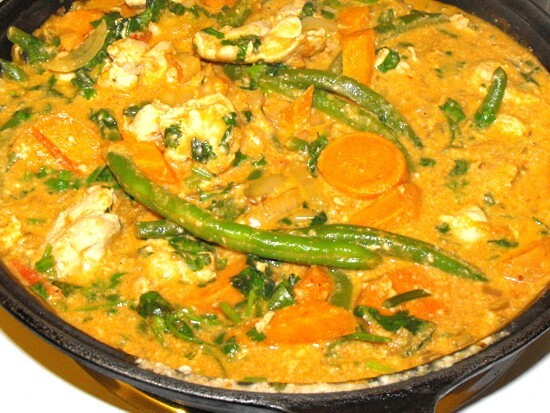 We’d love to hear your feedback to the sweet potato curry recipe with chicken. Did this recipe manage to convert your family into “curry enthusiasts”? Please use the Facebook-plugin for any comments. If you happen to have a favourite curry recipe, post it with a picture and a back story if it has one.